I painted Kali in 1996 for The Goddess Oracle. She is also in the 2001 Lewellyn Goddess Calendar. In Hindu India, all goddesses are ultimately one: Devi, whose name simply means "the goddess." But she takes different forms-perhaps a way of allowing limited human minds to fix on first one, then another, of her multiple possibilities. One of the most powerful, most common, and-to Western eyes-most terrifying of these forms is Kali ("Black Mother Time"), the goddess who perpetually transforms life into a fascinating dance of death. Her tongue juts out of her black face; her hands hold weapons; her necklace and earrings are strung with dismembered bodies. 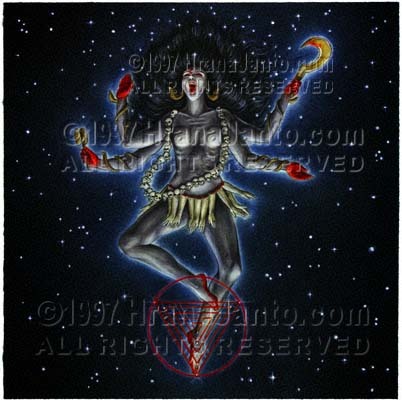 She seems at best a stern mistress, this Shakti ("animating power") of the creative-destroyer Shiva, the dancing god. As Durga, Devi is personified as a just warrior, purging the world of evil; as Parvati, the same energy exemplifies passionate attachment to sexuality. But as Kali, the goddess is uncompromisingly alone, the mother of death which swims in her womb like a babe; she is the force of time leading ever onward to destruction. And then, when she has destroyed everything, Kali will be the timeless sleep from which new ages will awaken. Kali first manifested herself when the demon Daruka appropriated divine power and threatened the gods. The powerful goddess Parvati knitted her brows in fury, and from her sprang three-eyed Kali, already armed with her trident. This emanation of Parvati quickly dispatched the demon and made the heavens safe again. Once born, this goddess remained in existence, beyond the control of even Parvati (of whom, it must be remembered, she is an aspect). Several famous myths tell just how uncontrollable is Kali's energy. Once, it was said, she dared to dance with Shiva, the Lord of the Dance. They grew wilder and wilder, more competitive in their dancing, until it seemed the world would shake itself to pieces--and so it will, for beneath all appearances that dance continues. Another time, it is said, Kali fought and killed two demons and celebrated her victory by draining their bodies of blood. Then, drunk with slaughter, she began to dance. Thrilling to the feel of lifeless flesh beneath her naked feet, Kali danced more and more wildly--until she realized that Shiva himself was underneath her and that she was dancing him to death. The god's tactic slowed Kali's wildness, but only for the moment, and eventually she will resume the dance that ends the world. Kali is still one of India's most popular goddesses: her picture hangs in many homes, her name is familiar in Calcutta (Anglicized from Kali-Ghatt, or "steps of Kali," her temple city). Served at one time by murderers called thuggee (from which derives the English word thug), the goddess of cemeteries was thought to thrive on blood; most often, however, goat rather than human blood was sacrificed to her, and it is still poured out in some parts of India today. So terrifying do these bloody rites seem that few understand Kali's spiritual significance. As a symbol of the worst we can imagine, as the most extreme picture of our fears, she offers us a chance to face down our own terror of annihilation. Ramakrishna and other great Indian poets sang rapturously of Kali, for they understood that she is a blissful goddess. Once faced and understood, these mystics say, Kali frees her worshipers of all fear and becomes the greatest of mothers, the most comforting of all goddesses.